Women In Dentistry Can Help With Toothache Remedies! Aside from just visiting our practice for your cleans every six months, it’s important to consider other reasons you may need a dental check-up. Here are a few things to keep in mind! 1. You’re experiencing a pain your tooth or mouth. A painful mouth or tooth may be the result of a cavity, trauma or oral disease. If the pain is persistent and doesn’t get better, it’s important to book an appointment with our practice. 2. You’re experiencing dry mouth. Dry mouth may be a symptom of a blocked salivary gland. Because saliva is necessary for a healthy mouth, you should schedule an appointment with our practice if you notice a change in saliva production. 3. Your teeth become sensitive to hot and cold temperatures. Sensitive teeth can be caused by a number of factors, including inflamed gums and periodontal disease. If you grind your teeth at night, this can also be a common cause. Schedule a dental check-up if this may be the case! 4. You don’t like the way your teeth look. If you aren’t happy with how your teeth look, considering veneers or braces may be ideal for you. We’re happy to discuss your options with you and go over payment plans for your needs. If we can’t help, we’re happy to recommend an orthodontist nearby who can. 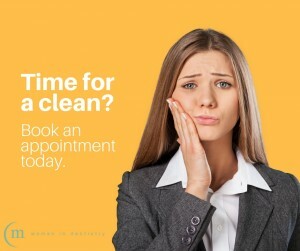 If you’re dealing with any of the four items on our list and looking for toothache remedies, or if it’s time for a regular dentist check-up and clean at Women in Dentistry, be sure to give your dentist Melbourne CBD a call to get your next appointment scheduled.